IC 5146 is a small round emission nebula in northern Cygnus with a prominent large dark nebula, designated Barnard 168, running towards it from the northwest. 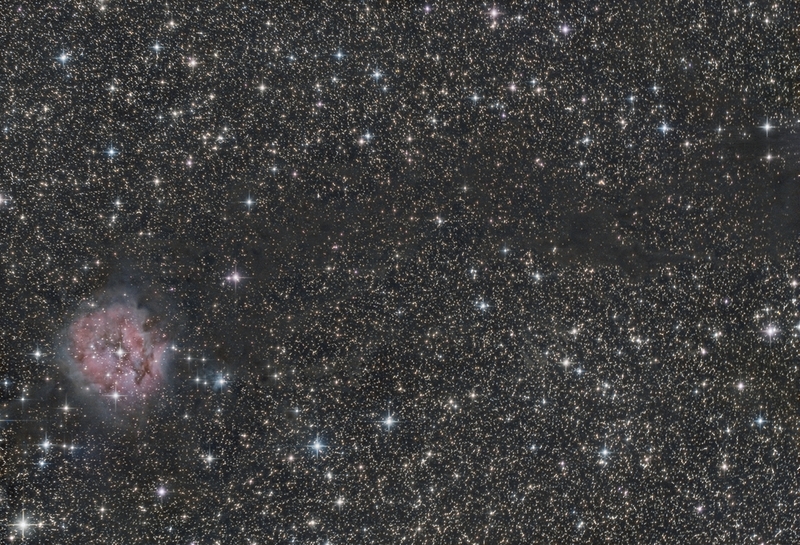 Several dark lanes are superimposed on the Cocoon Nebula itself. Inside the Cocoon, an open cluster of young stars is developing. Like other such stellar nurseries, the Cocoon Nebula is, at the same time, an emission nebula, a reflection nebula, and an absorption nebula. The nebula's central star, which formed about 100,000 years ago, now provides the energy source for most of the emitted and reflected light of the nebula. The globular structure of the Cocoon Nebula is rare in this part of the Milky Way, which is dominated by large diffuse HII regions. It is located at a distance of about 4,000 light years. IC 5146 - Cocoon Nebula, Wright-Newtonian photograph. Notes: Photo taken during my stay at the Großglockner-Hochalpenstraße in September 2018. My second try with the Alpha Tauri 2000/1000 Newtonian and the ZWO ASI camera. The somewhat elongated stars (caused by main mirror shifting) could be reduced by deconvolution. The Cocoon Nebula is located a bit apart of the main plane of the Milky Way in a relatively "anonymous" region, nearly at the border between Cygnus and Lacerta. It is not especially easy to find it, but there are a few "landmarks". A good sky chart like Uranometria or Sky Atlas 2000 should be at hand. Starting point is Deneb, Alpha Cygni. Going NE, you can follow a chain of brighter stars, all of them conspicuous in the finderscope. They form a curve which becomes flatter towards the east. If you continue the slight curve after the chain's end, you will hit the galactic star cluster M39. From there, the starhop becomes a little bit more difficult: 1.5 degrees north of M39 there is another chain of brighter stars, going a bit zigzag mainly east and a bit south. The last star of that chain is the conspicuous bright star Pi2 Cyg. Ok, once there, you can either continue with the finderscope, or, if you own a rich- field telescope, switch to the main telescope and use a low-power eyepiece. Using a finderscope: 1.5 degrees southeast of Pi2 there are two 7.5 mag stars aligned ESE. They can be found by elongating the chain of stars described above with a slightly greater curve to the south. At the easternmost of those two stars you are nearly there: About one degree to the south you find a "right- angle" of fainter stars, the shorter line pointing east, the longer one south. West of these stars, a small bit northwest of the brightest star there, the Cocoon Nebula is situated. Using a rich-field telescope: The Cocoon takes it name from the fact that it is nested at the southeastern end of a dark nebula, Barnard 168, which forms a long lane towards M39. Going about 1.5 degrees south from Pi2, and following a chain of mixed brighter and fainter stars, you will find the dark lane where the chain of stars ends. The dark nebula and the surrounding dense Milky Way star field is a very impressive view in a RFT at low power in a wide-angle eyepiece of high quality, which renders stars as pinpoints. At the eastern end of the dark lane the Cocoon is located. The dark nebula is more easily discernable in the eyepiece if you slightly nudge it north-south while following its eastern direction, the star-poor region is more conspicuous then. The dark lane splits somewhere along the way. Once you know the area, you will easily find your way around, as there are some recognizable stellar associations. Once you have located the Cocoon Nebula, you don't need a very big telescope to observe it. A fine 4" refractor is enough, given a dark 6mag+ sky. Without filter at low power (3.5 to 4 mm exit pupil) a dim nebula is discernable using averted vision. Of course seeing the nebula becomes easier using bigger telescopes, but, interestingly, a nebula filter is counter-productive. Even in an 18" scope, the nebula is inconspicuous using an UHC filter, and quite unobservable using an OIII filter. A better choice might be a H-beta filter, but the best view of the Cocoon is to be had without any filter, because then the nebula appears as in an 18" telescope as "cotton pad" with a few stars superimposed on it. These stars are not faint, and readily observable in smaller scopes, more easily than the nebula itself. The Cocoon Nebula is not very hard to see, but it takes some experience if you want to observe it in smaller telescopes.